Apple’s mobile devices are popular for a very good reason. The iPhone and iPad products are not merely trends. In many ways, these devices have had a significant impact on the mobile industry in several key areas. 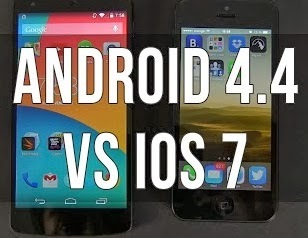 Apple isn’t just part of the industry - it has helped shape it into what it is today but on other hand Google’s Android mobile operating system is one of the biggest competitor of Apple’s iOS mobile operating system available for smartphones and tablets. 1. More Sharing Options - Apple iOS apps only allow users a few options for sharing content, such as Flickr, Facebook, Twitter, Message and Mail. Android enables you to move content via any installed app that has sharing capabilities. 2. Greater customization - Users can customize your Android smartphone any way you like by downloading various themes. There are numerous options when it comes to personalizing your device. 3. Superior Notifications Bar - iOS 7 may have improved the iPhone Notification Center, but it’s still not as impressive as Android’s. With the Android notification drawer, users have the ability to take immediate action. For instance, they can directly respond to whatever is in the drawer without having to first open the corresponding app.